May « 2015 « Geekorner-Geekulture. This whole show is about Hachiman coming to terms with his misery and growing up, and growing out of it. Episode 7 finally had Hachiman not just knowing this, but outright admitting it, that his actions don’t lead to desirable results, and that he’s maintaining a façade, rather than presenting his true face. Internal words are cheap though, so then we had episode 8, where Hikki had a long chat with Sensei, who explained to him how the world works, and how relationships work. Pain is a natural part of relationships, and people aren’t always rational agents, including Hikki and his friends. And then we had the episode’s second half, which was less than clear for many people (see an explanation for various points here), where Hachiman and friends finally made the first step to a great friendship, where they’ve had a fight and told everyone how they feel, and what they want, and what they want is to have friends, and to be less afraidtogether. This isn’t “the end”, because as last episode told us, it’s all about constantly trying to overcome challenges together, about dealing with hurting your friends, and being hurt with them. Let’s see how Yukino and Hachiman, far too used to “logic” and being resplendant in their loneliness, take to the new environment, but first, let us deal with Jazz Hands. I assume. This episode was pretty light and enjoyable, especially in its first two-thirds. Everyone’s avoiding touching the real issues. Yes, it means we’re not really getting into it with jazz hands, but more importantly, the characters are dancing around what happened last episode. It’s still raw, and they need to find a new balancing point. It’s not “everything’s normal” as we’ve had it for most of the season, where everyone’s trying to act as if nothing has changed because if they fake it, they just might make it. No, here everything exists between them and they acknowledge it, but they’re too self-conscious to put it out there in words, lest it breaks apart, or they end up crying again. So they spend time together, not to hide away the past conflict, but to try and build up on it. It’s a fine difference that’s hard to put into words, but it’s meaningful. It’s genuine. 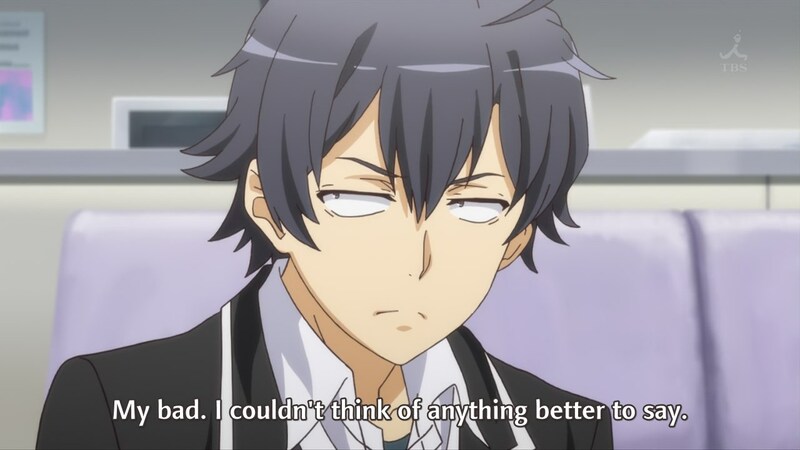 12 Comments Posted in anime, Episodic Notes Tagged My Teen Romantic Comedy SNAFU, OreGairu, OreGairu S2, OreGairu Zoku, Yahari Ore no Seishun Love Comedy wa Machigatteiru. After fielding a whole bunch of questions on my blog, and seeing the same questions pop up on reddit, MAL, Crunchyroll, and even a Russian forum that linked to my blog, I thought I’d try to tackle some questions about the scene in the second half of OreGairu season 2 episode 8. I’m not trying to convince you it’s “good”, or that the characters are “right”, but just try and explain the what and the why. I haven’t read the Light Novel, so this is all based on my read of the show on its own. You can read my massive notes for episode 8 here if you so desire, or check here for all my writings on the second season. 1) You think Hachiman is miserable? But he’s the batman, and he’s cool, and society is wrong, isn’t it? This question is more of a preamble into the mood of the entire FAQ. I’m not actually interested in giving value judgments on whether the characters are “right” or “wrong”. I’m trying to explain how they see the situation, and whythey are having problems with it. I mean, we sit here outside, some of us with years of experience more than the characters have. Whether I think Hachiman’s goal is right or wrong doesn’t mean much to answer the question, “Why does he try to change his methods?” And the answer is Hachiman is miserable, and was keeping this loner personality as an act to help him keep people, and his own emotions, at bay. He himself says he’s lonely and that his actions only isolated him further, while hurting those around him under the guise of it not mattering. 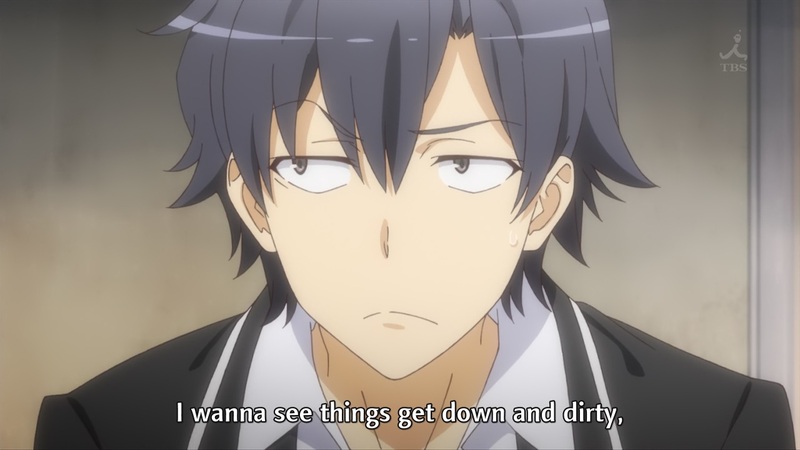 10 Comments Posted in anime, Episodic Notes, Things I Like Tagged My Teen Romantic Comedy SNAFU, OreGairu, OreGairu S2, Social Subtext, Understanding Emotions, Yahari Ore no Seishun Love Comedy wa Machigatteiru. 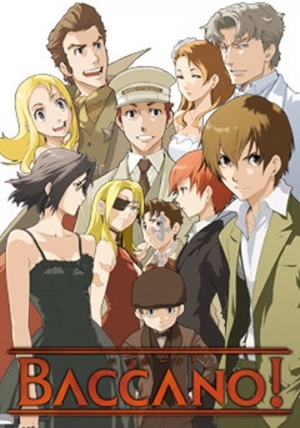 One of the most notable things about the Baccano! anime is its non-chronological storytelling, how the show weaves together several different storylines, with different characters or focus for each one. The show is so well known for this aspect, that when I came upon a project last year that spliced the entire show so it’d be told in chronological order, I felt bemused. The way in which Baccano! is told is a large part of the show’s identity, and I’m going to look at it and some other examples and counter-examples here. I’m actually going to begin by a counter-example, to better clarify what it is I wish to try and explore. The Melancholy of Haruhi Suzumiya’s first season, in its original 2006 broadcast, cut up the chronological order of the episodes. Each episode on its own did not involve temporal skips, but the episodes aired in the following chronological order: 11, 1, 2, 7, 3, 9, etc. For the DVD release and when the second and first seasons aired together, the chronological order was the one chosen. I’ll once again open with the post-episode editorial, because this episode’s write-up is so very long, and you might just want to read the bottom line. Well, lines, I expect there’d be quite a few of those. I know myself, which is a large part of this show’s theme, appropriately enough. I often find it useful to start from the end, because a single journey can lead to more than one conclusion, and it is by the conclusion that you look back and retranslate everything’s meaning. Speaking of translation and words, we have some pretty cool words for things that cannot be said, words such as “ineffable”, often said as “the ineffable”. Even the word “Sublime” often refers to an experience that transcends, not understanding, but words. Sublime works of art if they use words may use many of them to describe something, but that experience in the end is given to what is merely hinted at, pointed at, experienced. 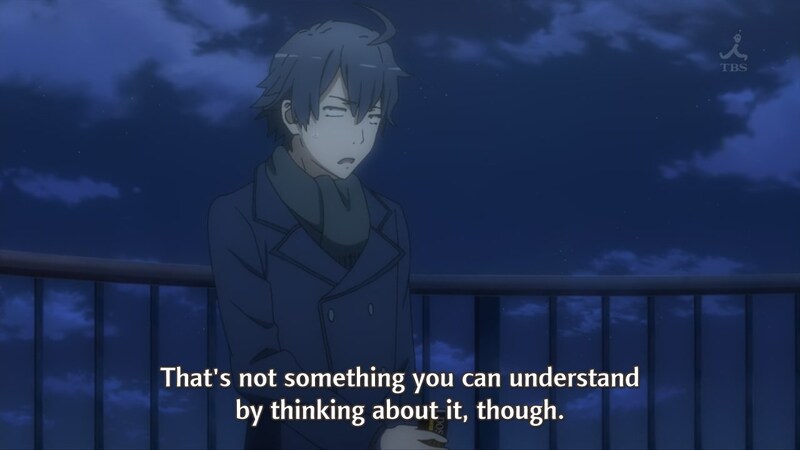 3 Comments Posted in anime, Episodic Notes, Things I Like Tagged Jacques Lacan, My Teen Romantic Comedy SNAFU, OreGairu, OreGairu S2, Understanding the Ineffable, Yahari Ore no Seishun Love Comedy wa Machigatteiru. I’m sort of busy right now in real life with many assignments being due for school (ah, the grad student life), so there might not be an overview next week. Well, with how I’m feeling about this season, maybe it is for the best. This was an interesting episode. While it didn’t have the high drama of episode 2 with Hachiman’s self-sacrificing fake-confession and his friends’ disapproval, nor Hayama and Haruno’s scenes with him in episode 4, outright calling him a “Monster of Rationality” or telling him to stop sacrificing himself, but this episode might have been more powerful in its quiet moments. 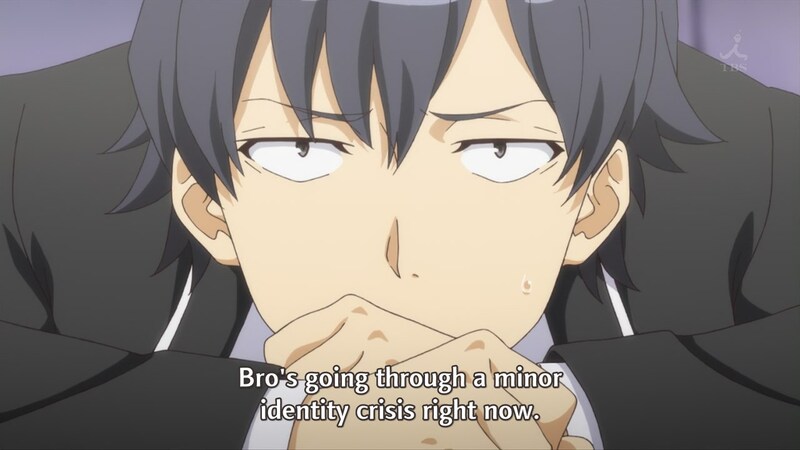 This episode shows us the results of a season and a half of Hachiman trying to grow, of admitting how much it is a mask he’s maintaining, and how he’s ready to admit it’s not the best thing for him or those around him. The following questions were taken from my Ask.fm page, and in both of them the question is posed in a way that seeks to apply a certain label to anime, and I answer that it’s hard, and not all that fruitful. The reasons in each case are different, but I think both answers work well together as an exhortation to look at how we look at things, and to identify that as more important than the result itself. Which anime works would you consider feminist? The long and short of it is that, often, answering such questions (and also, “What’s a libertarian work?” or “What’s a socialist work?” when dealing beyond outright manifestos) means something sort of weird, because all these things are ideological goggles to view other things throughout, rather than labels that apply to things per se. Even “Libertianism” which I said Mahouka espouses the ideals of. It’s mostly that these works contain some of the things these things aim for, or the ideas they use as basis. Let’s try something new, order-wise. I did consider just posting the “Post-Episode Thoughts” as its own editorial, and linking to the rest of the notes. Tell me what you think in the comment section! 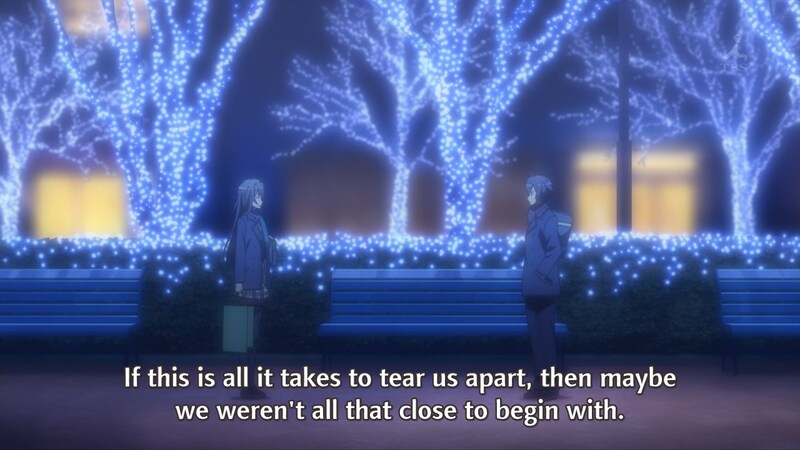 It finally hit me late last night, when last episode Yukino said that maybe they should stop taking new cases, and Hikki asked “Then what have we been doing all this time?” He was talking about his and Yui’s effort to maintain the club as is, and the rejection of it by Yukino. As a result of the deteriorating atmosphere in the club, and to still feel as part of it, Hikki has gone to help Iroha. What did we have last episode? The funniest episode that most resembled the first season. A mostly setup episode, with an in-episode cloying atmosphere of dealing with soft social power, by Yukino on Yui and Hikki, by Iroha on Hikki, and Iroha and her Student Council getting absolutely crushed by the other school’s president. You don’t need to shout at people or use physical violence to control them, and the atmosphere. Then again, isn’t that one of this show’s main themes? Now it only remains to be seen how much Hikki did or didn’t change since the Cultural Festival Arc last season. Will he help Iroha, or will he help her help herself? How this episode opened, and closed. This episode opening and then continuing with banter, first between Hachiman and Komachi (I’d like to call him “Hikki” here, but they’re both Hikigayas), and then between Hikki and Iroha was a small little thing. It showed how Hikki can be when he doesn’t have his barrier up, when he has relations he doesn’t have to question why he has them and can just act secure in the knowledge they’d be there. But of course, as we’ve seen when Komachi was angry with him, it’s exactly this closeness that motivates him to work in order to ensure the relationships can keep on going. 28 Comments Posted in anime, Episodic Notes Tagged My Teen Romantic Comedy SNAFU, OreGairu, OreGairu S2, Yahari Ore no Seishun Love Comedy wa Machigatteiru.